Industry leader seeks a Sales Engineer to quote and promote our products and parts, which include Liquid Mixers, Heat Exchangers, Feeder Systems, and Dust Collectors/Bags. Qualified candidates must work well in a small office environment. Candidate must have a technical engineering background and at least five years of experience with one or more of the products listed above. This key employee needs to problem solve and work independently. This person will coordinate all orders from purchase through manufacturing and shipment using Quick Books to send order acknowledgements, vendor purchases, and customer invoices/packing slips. This position requires some use of Auto Cad Lt to make proposal and manufacturing drawings; Access is used for quick proposals and is the basis for our CRM. We also use Word for more detailed quotes; Excel is used for costing and prices. Good communication skills are a must while working closely with vendors and customers. Individual needs to be detail oriented and very accurate. We are looking for leadership skills, a person who can multitask, a person who has skills in math or engineering (prefer college degree), someone who is loyal and committed to our company, customers and vendors. Winger has been in business since 1979. By always putting the customer’s interests first, we have earned a reputation for excellence and are a much valued supplier to our customers. We strive to offer customers performance improvements and suggestions to increase the longevity of their equipment. 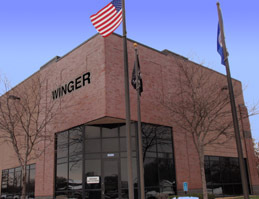 Winger Inc. is a leading provider of equipment, parts, services and filter bags for Heat Transfer, Liquid Mixing, Liquid Filtration, Dust Collection, and Feeder Systems.